Nature Made® Cholest-Off® Plus 900 mg - 210 Softgels - SALE! 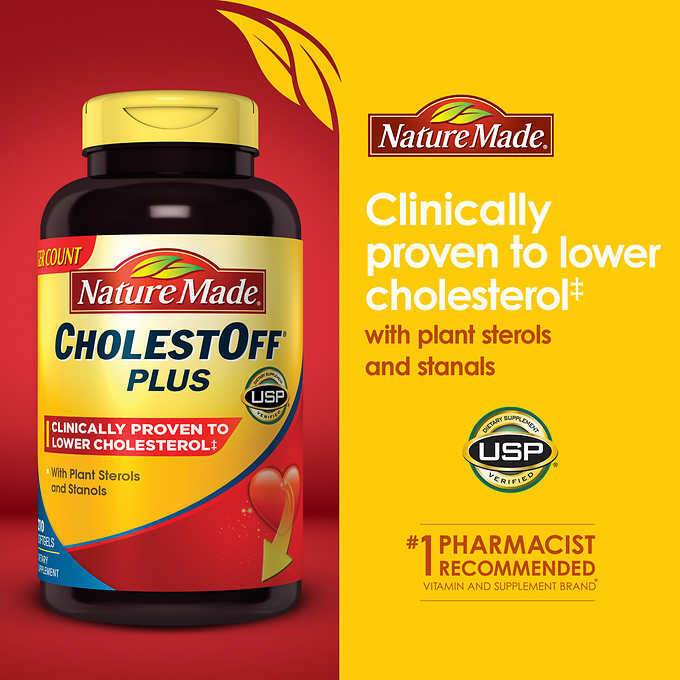 Nature Made® CholestOff® Plus is clinically proven to lower cholesterol. The National Cholesterol Education Program (NCEP) recommends 2000 milligrams of plant sterols and stanols as part of their Therapeutic Lifestyle Changes (TLC) diet to help lower cholesterol naturally. Given the amount of sterols and stanols naturally found in food, most people only consume around 200 milligrams through their diet. Choosing a supplement like CholestOff® Plus, which provides 1800 milligrams of plant sterols and stanols, can help you meet the level recommended by the NCEP to help lower cholesterol levels. CholestOff® Plus contains an exclusive blend of sterols and stanols, Reducol™. These plant-based ingredients, which are found naturally in fruits, grains, nuts and vegetables*, reduce the absorption of dietary cholesterol into the bloodstream to help lower LDL (“bad”) cholesterol. CholestOff® Plus is made with esterified sterols and stanols instead of free form sterols and stanols found in CholestOff® Original. These esterified sterols and stanols have been clinically studied and show consistent cholesterol-lowering results. Additionally, Nature Made has conducted clinical trials examining the effects of CholestOff® Plus on cholesterol. Our studies show that consuming CholestOff® Plus in addition to following the NCEP’s Therapeutic Lifestyle Changes (TLC) diet reduced LDL cholesterol levels. CholestOff® Plus is formulated in an easy-to-swallow softgel. Is safe and effective as part of a cholesterol management program. If you are currently taking prescription medication to lower your cholesterol, you should consult your physician before using and have your cholesterol levels checked regularly. Nature Made® CholestOff® Plus* is guaranteed to meet our high quality standards – it is made from carefully selected ingredients under strict manufacturing processes. For best results, Take two softgels two times daily with meals. Calories 10, Calories from Fat 10, Total Fat 1 g - 2%**, Plant sterols/stanols (from esters)^ 900 mg*. ^Sterols/Stanols are esterified with sunflower oil fatty acids. **Daily Values are based on 2,000 calorie diet. Plant Sterols/Stanols (Pine Tree), Sunflower Oil Esters, Gelatin, Glycerin, Medium Chain Triglycerides, Soy Lecithin, Water, Colors Added. Colors Derived from Natural Sources – No Synthetic Dyes. No Artificial Flavors. No Preservatives. No Yeast or Starch. Gluten Free. Caution: Not for use by children or pregnant or lactating women. Check with your physician before using CholestOff Plus if you are currently using medications to lower your cholesterol.